Cast Stone Dining Table. Stone furniture. Stone table. Inspiration for the Cast Stone Dining Table came from furnishings of villas around the Mediterranean region. Stone was one of the first materials to be used for making furniture. Archaeological research shows that Neolithic people used stone tables, beds, shelves, and seats. 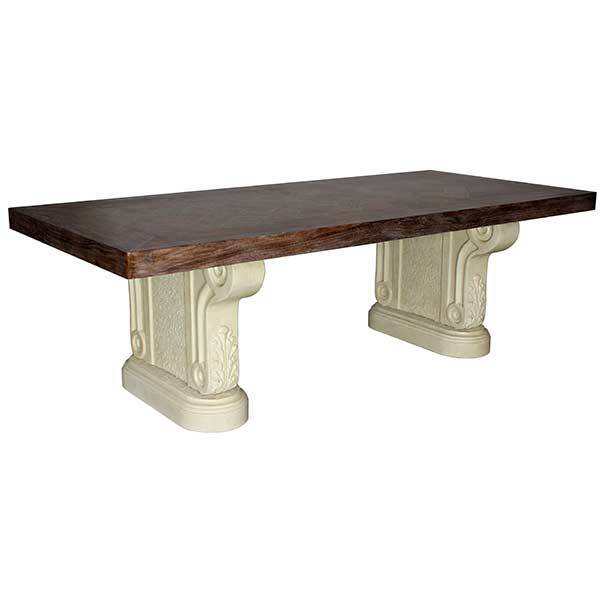 The Cast Stone Dining Table Base is offered in a variety of finishes. Top options include glass, copper, brass, and wood. With its casual elegance, it makes an exceptional dining table for eclectic residential and hospitality interiors. Cast stone is made from environmentally safe materials and is free of solvents and resins. Custom sizing is available. Designed by Shah Gilani, ASFD.